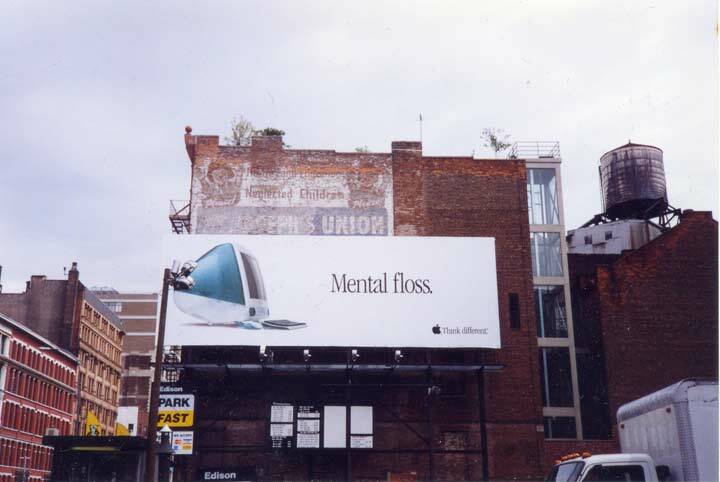 I found this curious mashup of the old and new on northbound Lafayette Street and Great Jones Street in 1999. Believe it or not this duo of ads has strings of influence that play out in Staten Island, Australia, and in Cupertino, California, the world headquarters of Apple Computer. The faded ad is for St. Joseph’s Home for Neglected Children, which was founded in the 1870s by Father John Drumgoole. The ad for St. Joseph’s Union encouraged donations to the organization that supported the home. John C. Drumgoole (1816-1888) immigrated from County Longford, Ireland, in 1825 to join his mother in America after his father’s death, and took work as a shoemaker when he became of age. He became the sexton and janitor of St. Mary’s parish in Manhattan’s Lower east Side in 1844, the third oldest NYC parish, and took a special interest in the thousands of homeless and orphaned children wandering the streets after coming to America in the aftermath of Ireland’s potato famine of the 1840s, or were left parentless during the Civil War. He provided food and shelter to these destitute youth in the basement of St. Ann’s for 21 years. Drumgoole had always aspired to the Catholic priesthood and after attending St. John’s College in the Bronx, now Fordham University and the Seminary of Our Lady of Angels near Niagara Falls, he was ordained at age 53 in 1870. He continued to help homeless children in the succeeding years. 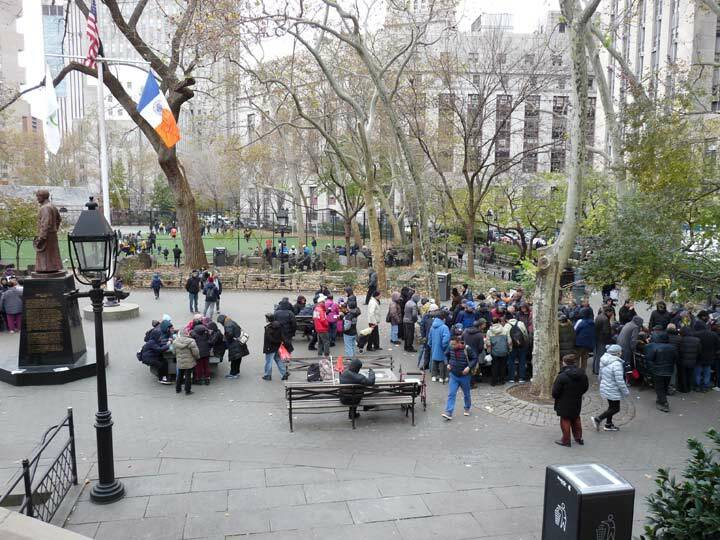 In those days tuberculosis and influenza ran rampant in the city’s poorer sections and it was thought that fresh air played a large part in recuperation and recovery. Thus, Fr. Drumgoole sought property well outside of town and in 1882 purchased the land in southwest Staten Island that is now known as the Mount Loretto orphanage. In March 1888, Fr. Drumgoole died during an illness acquired when he was caught out during the Blizzard of ’88 that month. I don’t know the status of the St. Joseph Home these days. Just after I had captured this image, another ad had replaced Apple’s, and the street artist Espo had placed his stamp on it, repainting the two children from the faded ad and adding his own message. The Mac computer shown in the ad is the first generation of G3s introduced in 1997. Their prime feature was a translucent rear in colored plastic, in “Bondi blue” named for the color of the sky as seen from the popular beach outside Sydney, Australia. The initial “i” stood for the computer’s intended ease of use connecting to the internet. The G3 was the first Mac after Apple’s founder, Steve Jobs, rejoined Apple after a few years fronting his own company, neXT. The model sold well, making Apple a player once again in the industry, and was revised repeatedly until its discontinuance in favor of the G4 in 2002. By the way the ad uses the primary font in Apple advertising in those days, Garamond Condensed. The corner of Great Jones and Lafayette remains a parking lot. The building was repainted years ago, with no trace of the St. Joseph ad nor its street art revision. There’s a wide billboard on the bottom and a square one on the top left these days. We had one of those Apples. It served us well for several years. The Mount Loretto property is now owned by NYS DEC.The girl’s (water) side building was destroyed by arson many years ago. I am not sure if the remaining buildings are being used.